What Is A Disperser For? Dispersers serve an important purpose for a wide variety of industries. This includes applications in the food, cosmetics, pharmaceutical industries, and more. Offering a low-cost way for companies to meet needs of their customers and produce a quality product. For these industries, dispersers are used because they're better able to generate the necessary force to break down lumps in liquids than other products, such as an agitator. While agitators are effective for some applications, they don't offer the power or force that dispersers do when it comes to breaking down lumps or powders in a liquid. This is an essential function for industries and requires the use of a disperser to help produce some of the top-selling products consumers are clamoring for. These critical tools help to make necessary products for overall health. Medicines created with dispersers help to save lives and improve the quality of life around the world. Dispersers create the full and complete mix of liquids and powders without the lumps or agglomeration, the result being critical to the pharmaceutical industry and the products they create. Dispersers are related to the science of rheology, or the science of flow and deformation. One factor often handled by machines like dispersers is shear stress. Shear stress relates to the flow of fluids on surfaces. Unlike regular stress, shear stress is caused when a parallel object causes stress on another object. Regular stress, however, is caused when objects perpendicular to each other cause the stress. Dispersers generally finish their applications at a rate of 10 horsepower for every 100 gallons. These products serve to handle work for critical industries by offering the power to handle the shear stress that other mixers are not designed for. The ability to break down agglomerations and lumps in liquids has direct implications for a variety of fields. Dispersers are a great fit for high viscosity applications such as blending powders in to liquids. For example, a disperser works to break down agglomerations in different products like cosmetics, pharmaceuticals, and more. How Do I Choose A Disperser? It can be challenging to gain knowledge about this product without expert assistance. 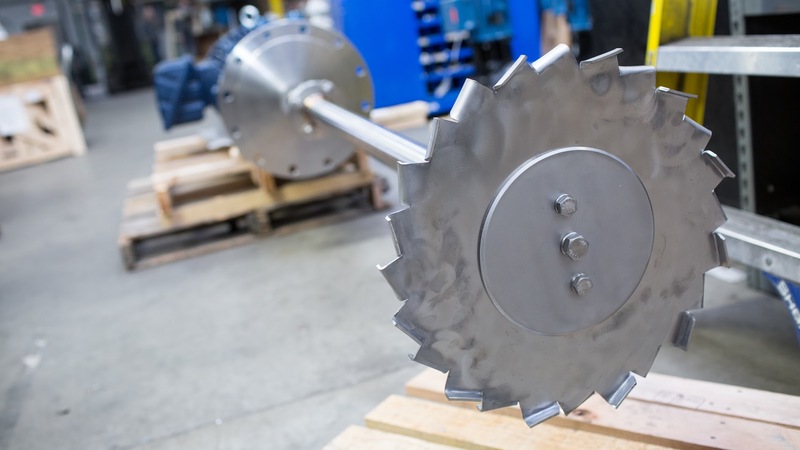 Companies like Mixer Direct offer accessible expertise to discuss the features and tools available for dispersers, as well as other resources related to these tools that are for numerous industries. Many manufacturers make dispersers in different sizes and with different features for any number of applications. Companies such as Mixer Direct offer a series of products that feature different sizes and speeds, creating dispersers that offer the ability to complete work for multiple industries and applications through only one machine. Given the speed and applications dispersers are used for, important features are available in numerous products such as these. For example, options on Mixer Direct's products include explosion proof controls and motors, preventing dangerous accidents from occurring. This is crucial as accidents delay productivity and hurt the ability to accomplish necessary tasks, while also endangering the lives of those using dispersers. Different products also offer a range of motors for different applications. Mixer Direct's DP line of dispersers range from one horsepower to 200 horsepower. The range offers customers the opportunity to complete a wide array of applications, giving them greater ability to do more work and increase their productivity. Totally enclosed, fan cooled (TEFC) motors, explosion proof motors, and air motors are other features offered through Mixer Direct's dispersers. Different types of motors offer different features for the user, based on their needs. This includes on the necessary horsepower for their functions and their work locations. TEFC motors offer the ability to protect the motor from outside factors, such as weather disturbances, air contaminants, and dust seeping into the motor. This makes TEFC motors a top-notch feature for users who work in outdoor environments or areas with a high-level of air contaminants or dust. Further customization options are offered on some dispersers, dependent on the company selling them. Mixer Direct's line offers features that allow the industry leaders greater ability to complete their applications while ensuring safety. For example, safety switches and digital speed controllers create greater ability to prevent accidents from happening when using a disperser. The DP line from Mixer Direct also offers an RPM readout to show the speed at which their product is offering. This feature can help determine if there are issues that need to be fixed by seeing sudden changes in RPM without the user affecting the controls. Dispersers and their varying sizes also offer the ability to have either greater or limited output, based on the needs of the user. For example, the products offered through Mixer Direct fit a range of applications from 5 to 2,000 gallons. This allows customers to purchase a product tailored to their needs without spending more money for increased output that isn't needed for their company. Technology such as dispersers are vital for everyday life, yet aren't understood by many individuals. Their purpose is important for industries relied on by millions every day. Dispersers are vital for producing pharmaceutical, cosmetic, and food products, further changing the world and serving a critical purpose in new manufacturing processes.